Explore Common Sense offers classrooms an opportunity to interact with a revolutionary text to better understand what it meant to its readers, both in the colonies and in England. The site uses the annotation software Hypothes.is as a tool to provide commentary to the text. We invite all visitors to the site to add their own commentary to the text using Hypothes.is. Hypothes.is is an excellent tool to facilitate critical analysis and discussion of the text. As an educator, you can invite students to a group to share and review commentary as a class. Only members of the group can view these annotations, highlights, and notes. Follow this link to access teachers' guides and tutorials on how to use hypothesis as an educational tool. We are pleased to share several lesson plans and activity guides for using Explore Common Sense in your classroom. Check out this PDF Teacher’s Guide with lesson and activity plans especially suited for high school level or entry level college courses. 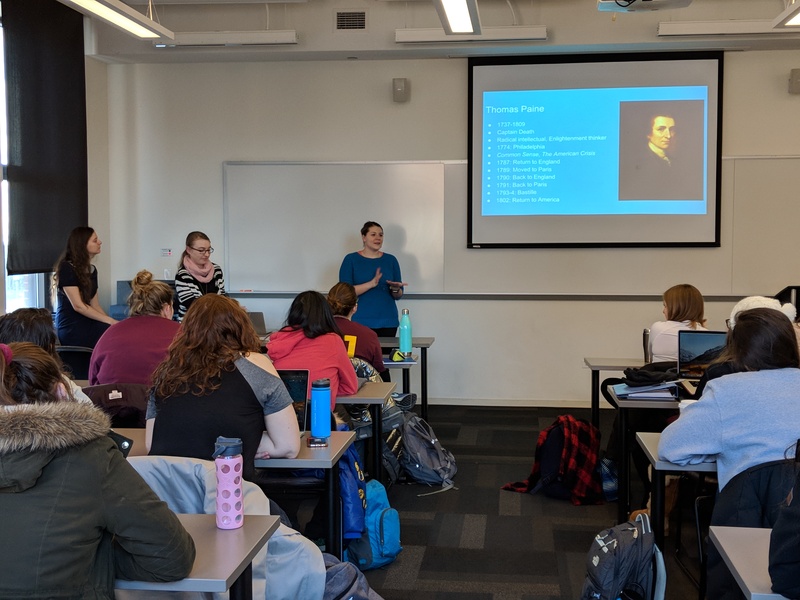 The Explore Common Sense team was pleased to have the opportunity to utilize the website in a Western Civilization survey class at Loyola University Chicago. Follow the link below for a copy of lesson plan and activity we used. The Explore Common Sense team invites an undergraduate Western Civilization survey class to annotate the site based on themes from their course. "Explore Common Sense is a dynamic teaching tool that helps to convey complex concepts about political thought in the early modern Atlantic world to students through engaging active-learning techniques. By reading passages from the British edition of Thomas Paine's famous treatise and identifying the differences between this and other editions of the same work, students learn important lessons about the relationship between language, ideas, and political action, as well as censorship and the power of the written word. Additionally, Explore Common Sense provides students with the opportunity to add their own ideas about the text to the larger body of thought surrounding this important work, thereby enriching our collective understanding of this past and its connections to the present. I highly recommend this tool for anyone teaching or learning about political thought in the Atlantic world, textual studies, or digital humanities." – Hope Shannon, PhD Candidate at Loyola University Chicago who used Explore Common Sense in her Spring 2018 undergraduate Western Civilizations Survey course. Explore Common Sense can be used in the classroom to meet the following Common Core standards in English Language Arts for History/Social Studies. Other standards from the K-12 Reading Standards may also apply, but are not listed here. Please visit the Common Core website for more detail.